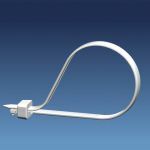 Cable accessories from a select range of leading specialist manufacturers, including cable ties and clips, lacing tapes and cords, plus other cable management accessories and tooling. With access to a considerable portfolio of cable management products, a solution can be sourced and matched to your specific requirements. Products are available in a wide range of materials, styles, sizes and colours, from Nylon to high performance Stainless Steel. Flat braided tape manufactured from 100% high tenacity continuous filament polyester yarn. This tape is impregnated with a specially formulated microcrystalline fungicidal wax to improve knot holding and tying characteristics. Flat braided tape manufactured from 100% high tenacity continuous filament polyester yarn. This tape is impregnated with a specially formulated synthetic elastomer finish to improve knot holding and tying characteristics. Flat braided tape manufactured from 100% high tenacity continuous filament polyester yarn. This tape is impregnated with a vinyl chloride acetate copolymer to improve knot holding and tying characteristics. 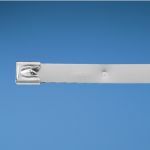 Pan-Ty® locking tie intermediate cross section 5.6in (142mm) length flame retardant nylon 6.6 ivory. Flat braided tape manufactured from continuous filament Nomex yarn. This tape is impregnated with a specially formulated self-extinguishing (flame retardant) synthetic elastomer finish to improve knot holding and tying characteristics. 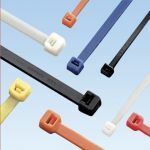 Sta-Strap® cable tie releasable intermediate cross section 5.3in (137mm) length nylon 6.6 natural standard package. 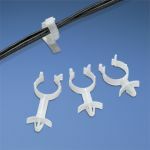 Zerohal cable protection for use with metal ties. Stainless steel cable tie extra-heavy 6in (152mm) max bundle diameter. Stainless steel cable tie extra-heavy 4in (102mm) max bundle diameter. Corrugated loom tubing solid wall .75in (19.1mm) x 100&ApplyFunction; polyethylene black. 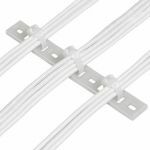 Dome-Top® barb ty cable tie miniature cross section 4.0in (102mm) length flame retardant nylon 6.6 natural (ivory). Pan-Ty® locking tie heavy cross section 20.9in (530mm) length weather resistant nylon 6.6 black bulk package. Pan-Ty® locking tie standard cross section 9.8in (249mm) length weather resistant nylon 6.6 black standard package. Military standard grommet edging strip .085in thickness flame retardant nylon 6.6 natural. Pan-Ty® locking tie standard cross section 14.5in (368mm) length heat stabilized nylon 6.6 black standard package. Ultra-Cinch? 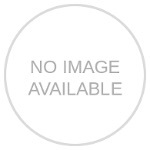 hook & loop cinch cable tie 18.0in (457mm) length .85in (21.6mm) width nylon hook nylon cinch ring orange. Spiral wrap offers abrasion protection for wires cables hoses and tubing .50in (12.7mm) x 250&ApplyFunction; weather resistant polyethylene black. Flat braided tape manufactured from 100% high tenacity continuous filament polyester yarn. This tape is impregnated with a specially formulated liquid nylon finish. Flat braided tape manufactured from 100% high tenacity continuous filament nylon yarn. This tape is impregnated with a specially formulated liquid nylon finish. Flat braided tape manufactured from 100% high tenacity continuous filament nylon yarn. This tape is impregnated with a specially formulated microcrystalline fungicidal wax to improve knot holding and tying characteristics. Flat braided tape manufactured from 100% high tenacity continuous filament nylon yarn. This tape is impregnated with a specially formulated synthetic elastomer finish which improves knot holding and tying characteristics. Flat braided tape manufactured from 100% high tenacity continuous filament polyester yarn. This tape is impregnated with a specially formulated self-extinguishing synthetic elastomer finish to improve knot holding and tying characteristics. Round twisted 3 ply cord manufactured from 100% high tenacity continuous filament Nomex fiber. 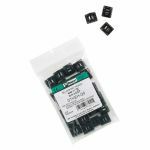 This material is intended for use in applications requiring heat resistance to 180 degrees C.
Pan-Ty® locking tie intermediate cross section 5.6in (142mm) length nylon 6.6 green standard package. Pan-Ty® locking tie intermediate cross section 5.6in (142mm) length nylon 6.6 red standard package. 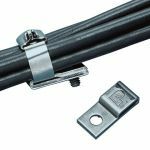 Sta-Strap® cable tie releasable standard cross section 15.0in (381mm) length weather resistant nylon 6.6 black standard package. 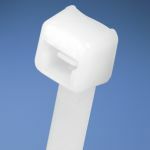 Dura-Ty?cable tie head heavy cross section weather resistant acetal black 25 cable tie heads. Dura-Ty?cable tie strapping heavy cross section 50.0in (15.2m) strap length weather resistant acetal black 50 reel of strapping. Flat braided tape manufactured from 100% high tenacity continuous filament nylon yarn. Round twisted 3 ply cord manufactured from 100% high tenacity continuous filament Nomex fibre. 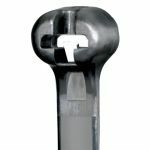 This material is intended for use in applications requiring heat resistance to 180 degrees C.
Pan-Ty® locking tie standard cross section 14.5in (368mm) length nylon 6.6 white standard package. Flat braided tape manufactured from 100% continuous filament Teflon coated fiberglass yarn. This tape is impregnated with a specially formulated microcrystalline fungicidal wax to improve knot holding and tying characteristics. Base yarn stable 427°C. Spiral Wrap offers abrasion protection for wires cables hoses and tubing .25in (6.3mm) x 100&ApplyFunction; fire resistant polyethylene black. Flat braided tape manufactured from continuous filament Nomex yarn. This tape is impregnated with a specially formulated self-extinguishing synthetic elastomer finish to improve knot holding and tying characteristics. Pan-Ty® locking tie miniature cross section 5.6in (142mm) length weather resistant nylon 6.6 black bulk package. Pan-Ty® cable tie HALAR distinctive maroon color standard cross section 7.4in (188mm) length bulk package. Pan-Wrap™ split harness wrap 1.5in (38.1mm) 50 ft. (15m) per reel polyethylene black. Pan-Wrap™ split harness wrap .75in (19.1mm) 100 ft. (30m) per reel polyethylene black. Slotted grommet edging .144in thickness flame retardant polyethylene natural. 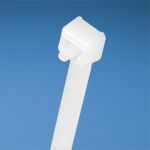 Pan-Ty® locking tie standard cross section 15.5in (394mm) length nylon 6.6 natural bulk package. Pan-Ty® locking tie standard cross section 15.5in (394mm) length nylon 6.6 natural standard package. 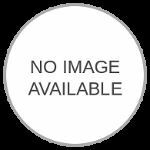 Pan-Ty® releasable tie standard cross section 6.3in (160mm) length nylon 6.6 natural bulk package. 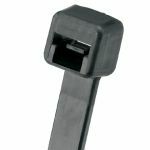 Pan-Ty® locking tie light-heavy cross section 14.5in weather resistant polypropylene black. Sta-Strap® clamp tie standard cross section #10 (M5) screw 7.4in (187mm) length nylon 6.6 natural standard package. 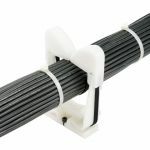 Dome-Top® barb ty cable tie intermediate cross section 11.3in (287mm) length heat stabilized nylon 6.6 black. Flat braided tape manufactured from 100% high tenacity continuous filament nylon yarn. This tape has no finish. Slotted grommet edging .106in thickness nylon 6 natural.